Launch of the Yasen-class submarine Kazan, March 2017. Russia has had a lot of wonder weapons in the news, from combat walkers to nuclear-powered cruise missiles. Many of these weapons verge on the ridiculous or are the product of propaganda, but some are legitimately concerning. One scenario that keeps Pentagon planners up at night: the threat of sea-launched cruise missiles, ferried halfway across the Atlantic by Russia’s new submarines, threading their way through American airspace to deliver their deadly nuclear warheads on unsuspecting targets. Welcome to the new Yasen-class submarines. At the end of the Cold War, the Soviet Union had the largest submarine force in the world. From the deep-diving titanium hulled submarine Komsomolets to the nuclear-armed leviathans of the Akula class class the Soviet submarine fleet was large and rapidly catching up to the U.S. submarine fleet. The collapse of the USSR meant the Russia that inherited the Soviet Navy suffered from too many ships and not enough money, and so the new Russian Navy limped along, barely sustained by the starvation budgets of the 1990s. 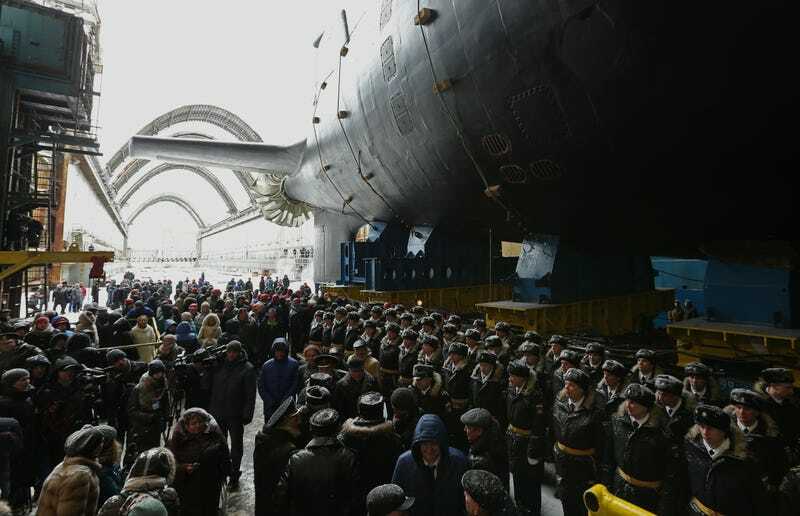 Hundreds of submarines were discarded and new boats were started that took decades to finish. Internal diagram of Yasen class. Oniks anti-ship missile and Kalibr land attack cruise missile. Submarines with Kalibr missiles could launch decapitation strikes against key government targets across the United States, crippling the ability of U.S. strategic forces to retaliate. The closer the launching submarine can get to the U.S. mainland, the deeper the cruise missiles can fly into North America and the harder it is to stop them. It was this threat of Russian cruise missiles that sent the Pentagon scurrying to develop the Joint Land Attack Cruise Missile Defense Elevated Netted Sensor System, or JLENS. JLENS was a network of radar-equipped aerostats that flew high over the Northeastern United States, their radars looking down to detect cruise missiles flying below. The program went into a coma after a 2015 incident in which one of the aerostats broke free of its moorings and flew free across the state of Pennsylvania. Moscow probably does not intend for the Yasen/Kalibr combination to be a first strike weapon, but it does theoretically have that capability and the Pentagon believes the capability needs to be addressed. The Yasen submarine is that good. Russian President Dmitry Medvedev, second right, speaks at a launching ceremony of the Severodvinsk, 2010. Note shrouded propeller. The United States has responded to the threat by reactivating the Second Fleet, an Atlantic based fleet command oriented toward the approaches to the continental United States. Post JLENS, there are rumors of a new system designed to detect missile launching submarines across the continental United States. New P-8 Poseidon submarine hunting jets and the Navy’s next generation frigate will lend heft to the Navy’s new submarine defenses, but the service is still a long way from the varied, complex, and skilled anti-submarine warfare forces it maintained during the Cold War. For now, the best hope the Yasen-class won’t be the major threat it could be is the state of the Russian economy. Although the Moscow is over the economic pain of the mid-2010s and in a gradual recovery, growth is slow and the Yasen class is extremely expensive. Russia, whose economy is smaller than Texas’, has only built two such submarines in twenty years. It has aspirations to build a total of eight. At this rate, it could be a long time before there are enough Yasens to constitute a serious problem.